Blue gray glass quartz mosaic tile contemporary look to a project. Blue & gray hexagon glass & marble mix mosaic tile. Dark Gray blue resin, travertine & glass mosaic tile. 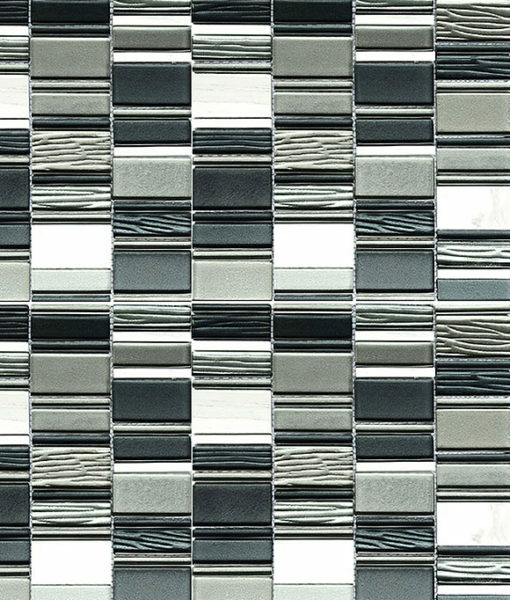 Black, dark gray colors glass & quartz mixed mosaic tile. Add a contemporary twist to the traditional color palette in most kitchens with a healthy dose of blue swirled throughout. Whether you want to keep it relatively neutral with silvery shades of blue swirled among metal or opt for the whimsical charm of varying shades of blue, blue backsplash tile is a decidedly fashion-forward yet relatively neutral choice for your project. Blue backsplash tile can come in any range of shades for the palest grey-blue to the deepest shade of navy. Make it as neutral or as bold of a home décor statement as you would like to make it. The options range in style from slick and modern to contemporary with dashes of old-world charm. Your backsplash will be the fashion-forward focal point you’ve been searching for with one of these choices. The mosaic tile options available with blue backsplash tile are plenty, featuring ceramic, glass, metal, travertine insets and even more. You won’t be sorry with any one of these easy to maintain, low upkeep options for a backsplash. Any of our high quality blue backsplash tile choices is sure to be crafted from a durable substance that will last in your kitchen through the years ahead. No one wants to plan a full kitchen remodel every few years and your backsplash should last as long as your kitchen does. Simply maintain these mosaic tiles by wiping them down with a damp rag and keeping spills and potential staining to a minimum. Many of the surfaces available are naturally water-resistant, allowing droplets and spills to roll right off their slick surface. Blue backsplash tile could be the long-lasting design statement you’ve been attempting to find for your next home project. Let the blue breathe new life into your drab kitchen and create a simply stunning view.